Admittedly, this Lady of ballet is "very first"
When she was young and was in the Ballet Theater of New York the legend says she did not make any noise with her shoes when sliding down the track. It was the stage in which she was levitated possessed by the devil, with whom she had a secret pact: to be faithful to the cuban Revolution and to the evil one who was nothing less than Fidel Castro. In Havana, the performances at the former García Lorca theater - now called by her name - had been sold out weeks before by gays and old wives of ambassadors full of pearl necklaces and earrings of precious stones, wrapped in mink skins although the temperature outside was of 32 degrees. 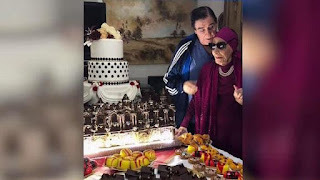 Before her dance, when Alicia made a dizzying "fouttet" or an "arabasque" the gays exploded in applause and had no more expression to define the art of the lady than shouting "Puta"-hucker- "Witch"
Now, when she has about 200 years old, she did not have flour to make cakes or sweets. There was only flour left for Raul Castro, his daughter the princess and a handful for Diaz-Canel. But Alicia Alonso was not without her sweets. She was very intelligent, she asked her aunt in exile that was already a mummy of about 250 years to send her a sack of flour. Thus, leading pastry could make the cake but not before stealing a quantity of flour to cheer up their families who already hated the so-called loaves that the government gave to the people and that seemed like a new kind of flour imported from an African tribe that they used to fatten pigs. Congratulations Alicia. First ballerina and glory of the world ballet for your 98 years old.